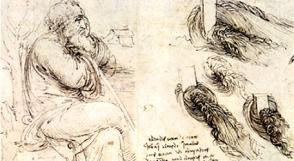 Perhaps the most expensive 'journal of ideas', Da Vinci's Codex Leicester is on display at the Chester Beatty Library. The 500-year old "ideas jotter" showing some of the great scientific and philosophy ideas which are still in use today, was bought by Microsoft founder Bill Gates for $31m (€23m) in 1994. Read more: Shane Hickey. Image from Independent.ie. That is amazing, i love Leonardo da vinci, its a little depressing that someone can buy such a journal. if i was dead and someone bought my journal i would be mad.